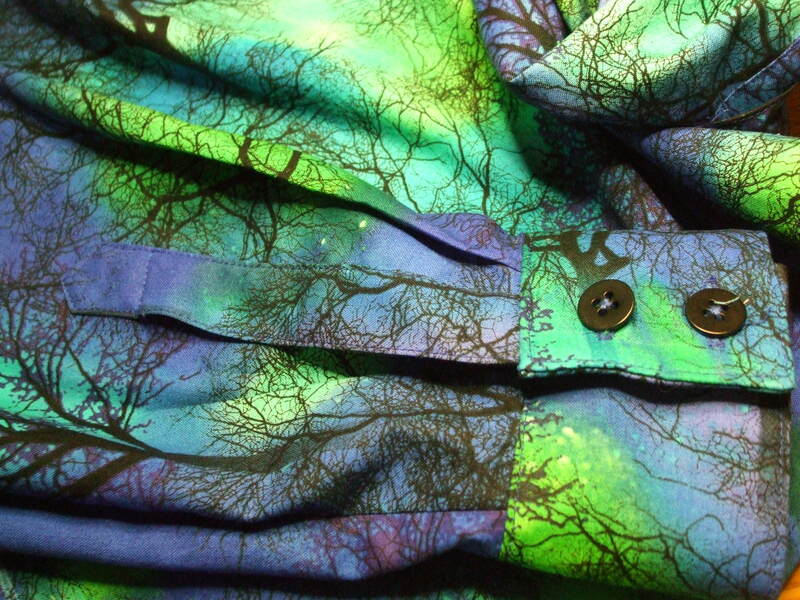 McCall’s 6436 ‘seventies style’ shirt, 100% cotton ‘Northern Lights’ print from Frumble Fabrics in rich green and blue. This time I remembered to cut the shirt about 3″ shorter [just as well, as I JUST squeezed it out of the yardage], and cut out the two piece sleeves as one-piece, using the lovely tower placket from the Folkwear frontier shirts pattern. Easy peasy, French seams where feasible…which turned out to be everywhere as long as I stitched slowly, tiny hem, plenty of woven fusible interfacing for crisp collar, cuffs and button stand. The collar on this is a lovely shape, very nicely drafted, and stands up beautifully. I ran an ease stitch round the neck edge before stitching it on, and it made it very very simple to apply without puckers on the shirt body, a common problem I have!